One of the really cool things about kitchen scraps is that they don't all just have to get tossed into the trash, put down the garbage disposer, or added to the compost pile. Many people aren't aware of it but there are many scraps that can be "re-grown" into new plants with just a little time and basic gardening/growing supplies. 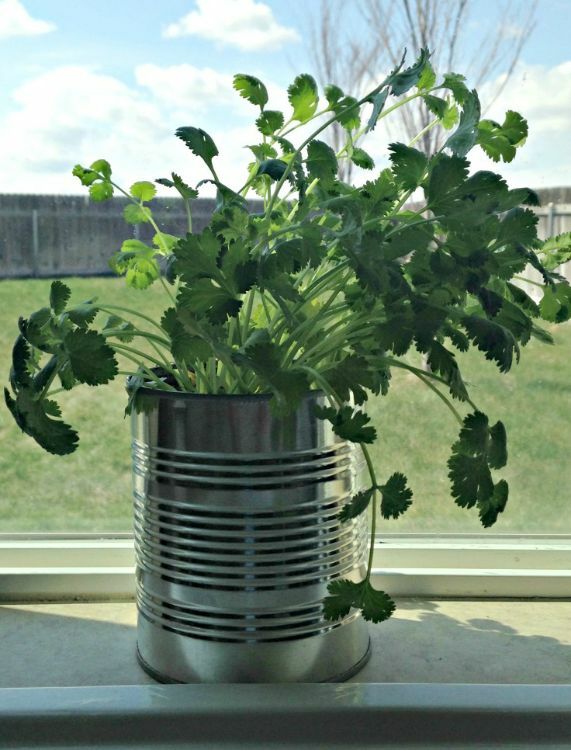 So take a quick look at some of the most commonly grown plants that can be started from scraps. Next time maybe you won't be so quick to get rid of them! 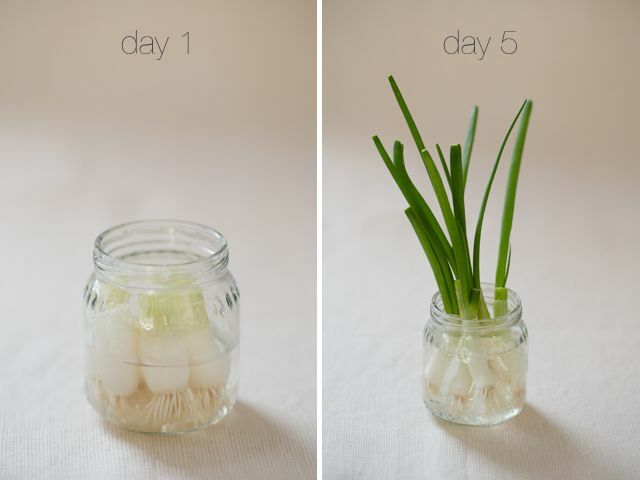 Green onions are probably one of the easiest plants to regrow from scraps and the one that is regrown the most often in the home kitchen. Cut the last 1" or so off of the onion and place the bulb in a shallow amount of water. Changing the water daily, you should see new growth begin within a couple of days. 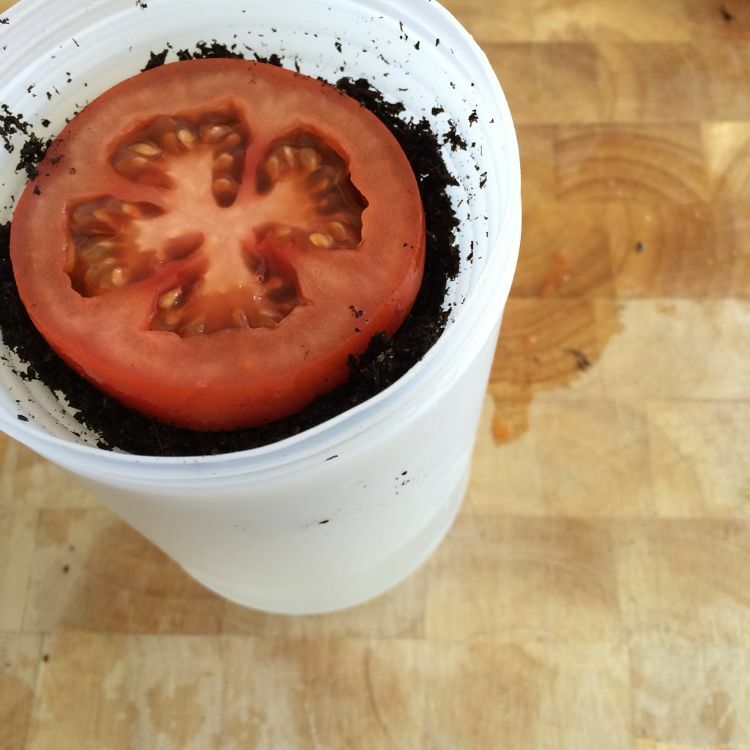 Either leave the plants in water to grow or plant them in potting soil when the shoots reach a couple inches long. 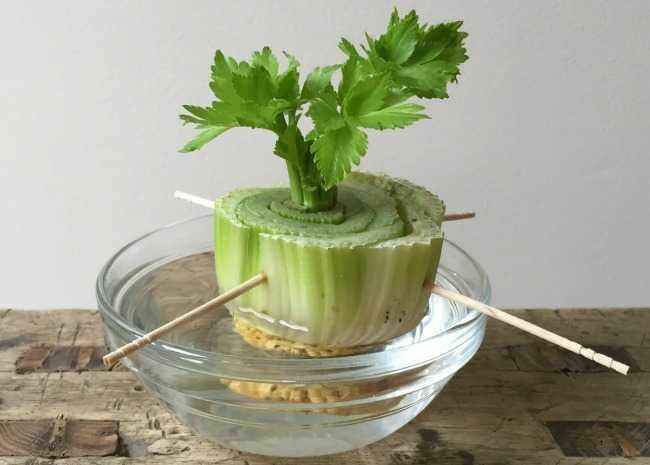 To regrow celery, cut the base of the celery stalk off and place in a dish or bowl with fresh water, making sure to not submerge fully. Place in a warm, sunny windowsill and wait for new shoots to emerge. 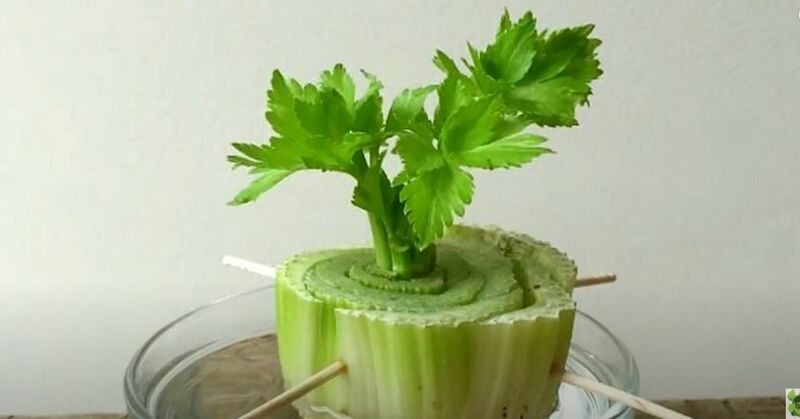 After the sprouts appear it's safe to plant the celery into potting soil covering everything but the new leaves. After the stalks regrow remove what you need to cook with, leaving the roots in the soil. 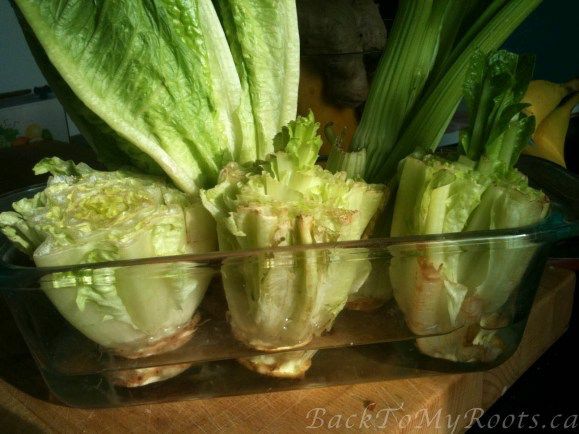 Really similar to celery, romaine lettuce is easy to regrow. Take the bottom heart and place it in a container of water covering the base of the heart. You can start eating new leaves as soon as they appear or move the plant to a potted container or sunny spot in the garden. Remove the outer leaves, leaving the innermost ones to keep the plant growing. Once your potatoes have started to sprout in the pantry, there's no need to pitch them. They're right where you want them if you'd like to try growing your own! Cut them into 2-3" pieces making sure there are a couple eyes on each piece. Allow them to sit out and dry for a few days and then plant into containers or the garden. 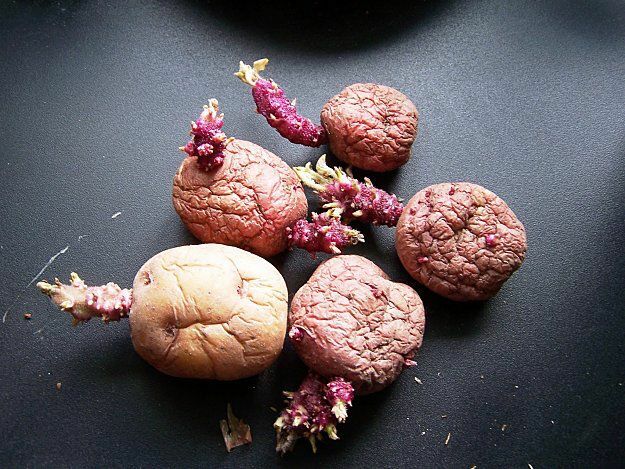 Rodale's Organic Life talks about 7 different ways you can plant potatoes. 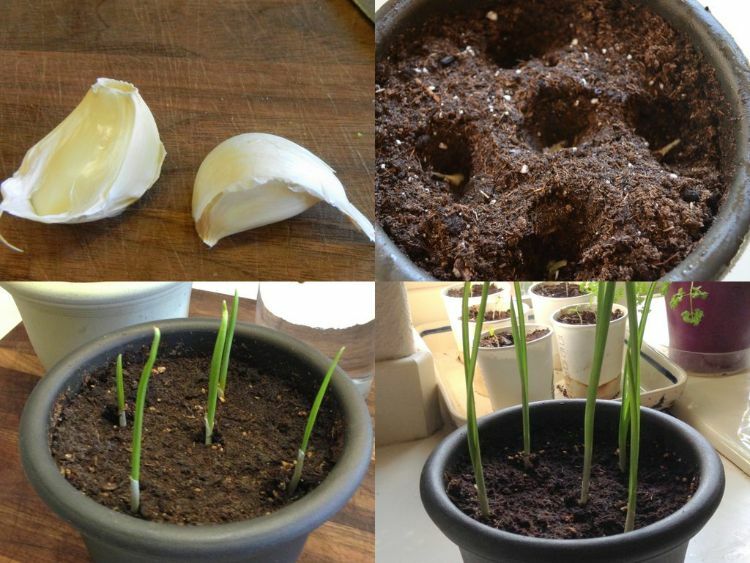 Starting with organic garlic, remove a few of the largest cloves from a head and place them in the soil, root ends down. Mulch well to retain soil moisture and keep the soil from overheating in the direct sun. When the bulb sends up "scapes", make sure to remove them so the plant concentrates on sending its resources to the bulb and not the foliage in an attempt to make it flower. If the roots are still attached, that's perfect, but cilantro can easily be grown from a cut stalk of herbs. Cut a 4" stem and place it in a container of water in a sunny location. When the new roots reach about 2" in length you can transplant them into your garden to grow there.